We describe the evolving learning design of a computer-based exercise called Director's Cut that challenges students to create their own video sequence from a set of clips we provide. The context is a film theory course where the community of educators have been interested in introducing practical exercises so students can, for example, experience how their choices influence which character the audience identifies with most strongly. This design process is presented within the theoretical frames of multimodality and production based learning, offering insights into how we balanced constraints and creativity as learning designers in the context of a South African university. Keywords: South Africa; film theory; production based learning; multimodal; creativity. While audiences watching television and films understand the messages being communicated through editing, they are generally unaware of the specific conventions and techniques being applied in their production. In part, the role of introductory film courses is to make students aware of such conventions, their relevance, and their impact on the audience. The majority of students studying film criticism at an introductory level have little or no practical experience in screen production. Teaching methodologies in film theory and analysis courses are traditionally text based. One of our underlying premises is that the capacity of a film critic to recognise and assess the skill of a filmmaker is enhanced if they have a sense of the process rather than just the end product. Production based learning approaches can support students learn film theory by enabling the analyst to do the cinematic equivalent of 'reading between the lines', appreciating decisions made by the director, the editor and other involved in the filmmaking. Director's Cut , the computer-based exercise we developed, invites film analysis students to apply their understandings of theory and to edit their own short sequence. This is one component of an undergraduate film narrative course about film spectatorship, genres, and modes of composition as well as editing practices and conventions. The exercise integrates other teaching and assessment components complementing the traditional essay assignments, seminars and lectures. The process of developing such learning activities is invariably collaborative, drawing on the skills of many people. It is the nature of such productive collaboration among educators and how we understand design choices that enables us to develop effective exercises (Morrison et al 2005 under review ). In much the same way that most viewers are unaware of film editing conventions, these aspects of learning design and collaboration are generally invisible even to colleagues who may be involved in the process. We present the process of developing Director's Cut as an educational case in which information communication technologies (ICT) is positioned within a broad socio-cultural approach to learning at the University of Cape Town (UCT). The role of UCT's Centre for Educational Technology (CET) is to develop and research the situated and integrated roles of ICT in the changing landscapes of higher education in post-apartheid South Africa (e.g., Czerniewicz 2004). CET has extended its role to encompass supporting staff development and it is in this context that the three authors were able to collaborate and reflect on how ICT is impacting not just on student learning but also on deepening our understandings of the creative uses of technology. We now also use Director's Cut in CET's staff development workshops as an example of what Laurillard (2002) would classify as a 'productive media form'. This enables us to illustrate how students might be supported in the production of multimodal texts that assess understandings of conventions and processes, extending expectations about the use of ICT beyond course websites. The paper is based on a shared interest in designing and developing contextually appropriate resources for students' own production based learning. This involves students and staff alike in understanding and generating intersections of media types and modes of expressive communication. Together these media and modes may be conceptualised as multimodal discourse (e.g. Kress and van Leeuwen 2001). The paper also addresses matters of how a Community of Practice (e.g. Lave and Wenger 1991) is being built around the development of socio-cultural approaches to ICT in teaching and learning for lecturers and tutors in the Humanities. Finding ways of assisting and improving students' learning about filmic conventions in and through genre is a rich area to investigate using ICT. We see ICT as providing flexible tools and communication sets for deconstructing film 'languages' and for reading and composing multimodal discourse (e.g. Rabinowitz 2002; Kress and van Leeuwen 2001). Here we access recent writings on multimodality and position them in relation to teaching and learning with and through ICT in a southern African context. In Part 2 we provide a frame in which we consider how research in multimodality, production based learning and the building of a Community of Practice, together with considerations of the local context of educational technology work and film studies at UCT. These we suggest are useful tools in understanding our learning designs. In Part 3 we give a more detailed description and analysis of Director's Cut . Finally, we reflect on factors that appear to either encourage or inhibit more creative use of technology and the impact that this can have on staff development and student learning. While much of the paper is conventional in its style of presentation, Part 3 includes annotated illustrations as a means of communicating the research text. Later in the paper we show the actual screenshots of the interface. This allows us to depict aspects of the learning experience that cannot be included in a paper. The annotations are also an instance of communicating multimodal pedagogies and analysis. We see our research rhetoric needing to reflect how we are aiming to influence teaching and learning through the use of multimodal production. Traditional university film studies programmes tend to place greater emphasis on analytical skills rather than production skills. This is indicative of the genesis of film studies in the academy in contrast to vocational or technical film schools where production is central. The 'experiential learning' teaching philosophy at the Centre for Film and Media Studies (CFMS) emphasises the interpenetration of theory, analysis and creative practice (Kolb et al 2001). At UCT and elsewhere, university level courses are increasingly including digital tools and technologies as modes and means of learning about film. In part this is changing with greater access to inexpensive and high quality film making and editing equipment. However, in large classes this places considerable strain on material resources as well as requiring extensive support by both technical and academic staff. As Tomaselli and Shepperson (2003) observe, these demands often create tensions between academics and university administrators. Therefore Director's Cut was designed with collaboration and input from administrators, academics and technical experts to offer large classes equitable access to media technology and training, while limiting costs and supervision in an institutional context where enhancing technological competence is a concern, but funding is limited. The needs assessment phase of the curriculum design process (Flowers 2001) identified the importance of bridging the digital divide and enhancing multimodal connections between thinking and doing, and between image, sound, text, and abstract theoretical concepts. We also identified the need to offer students opportunities to express their creativity in practical ways while considering the overall experiential and emotive impact of a film text on spectators. The ideal is to design creative exercises that are manageable and to avoid unrealistic expectations of what technology can contribute. What we wish to explore here is how such creative designs can develop through applying multimodality, learning theory and communities of practice. Director's Cut has far fewer features than sophisticated professional editing software, requiring much less technical expertise than an assignment where students shoot and edit their own film. For educational purposes limiting functionality to simplify the activity has distinct advantages. First, the combinatorial storyboarding and editing features in Director's Cut were designed to support a multimodal comment loop, an annotational tool and a loop that encouraged students to review their sequences. Such features, which offer feedback and reinforce learning, are not available using existing software like iMovie or professional video editing applications. Second, unlike a more open-ended shooting and editing exercise in which students may be inclined to focus on either technical mastery or creativity at the expense of critical reflection and the application of film theory, Director's Cut has well-defined learning objectives with strong links between theory and creative practice and an appropriately aligned assessment. It requires less intense supervision, shifting the focus from mastering technology to understanding the relationships between technique, content, meaning and impact. Technology has been seen as one way that such creative tasks can be structured and scaffolded to avoid some of the assessment challenges introduced by multimodal pedagogies. Such pedagogies take the position that traditional written assignments should be seen as just one collection of 'semiotic modes' (Kress 2003). In terms of a multimodal pedagogy, the aim is to provide scaffolding for students to communicate their ideas using a variety of discourse modes and media types, such as oral presentations, pictures, video, dance, and music, and combinations of these (e.g., Davis and Reed 2003; Morrison 2004). The Director's Cut exercise ran towards the end of Jane Stadler's large introductory Film Narrative course (FAM201S) in September 2004, with about 250 second year students. This theory course investigates the process of film narration from screenwriting through to an 'auteur' approach to film studies that considers film authorship in terms of a director's 'signature style'. It examines the relationship between meaning, form, ideology and narrative structure and explores the influence of the conditions of production and reception on storytelling and meaning making. 2 Here students are introduced to a range of theories of narration and spectatorship, and are required to develop critical skills that enable them to analyse genre, conventions and character engagement. One of the initial proposals during the preliminary design phase early in 2004 was a suggestion by a colleague that we provide a basic script and then ask students to search for photos on the web and crop these to produce their own storyboard, cinematography notes and script. This draws on the notion of multiliteracies in which learning with ICT crosses media types and discourse modes in multiple combinations. Cropping photos is often used in textbooks to illustrate the differences between say long, medium and close-up shots (e.g., Nelmes 2003). Although many of the rules can be illustrated in this way, it still requires considerable imagination to conceive the final product. While this approach is valuable, it provides few scaffolds of the learning process and is relatively open to diversions in large classes: there is always a tension between giving students freedom to express themselves and requiring they give voice to their own critical reflection. Andrew Deacon's suggestion was that if we could shoot appropriate video footage, students could develop their own narrative structures from these clips. By adapting an earlier activity called NewsBreaks (van der Vliet and Deacon 2004) , we could develop the equivalent of a simple 'multimodal word processor' for students to produce edited sequences. Working with video forces students to consider how the script matches the pictures in each frame as well as the cuts, which is more challenging than in pre-production storyboarding where there are fewer constraints. This proposal became the basis for the design of Director's Cut which located students in a role somewhat like that of a director arranging a rough edit; student 'directors' need not be concerned with all the details of the scriptwriter, camera operator or editor as such. The CFMS offers a range of courses and perspectives at undergraduate and postgraduate levels. 3 A small but dynamic Community of Practice between CFMS and CET has been built through various collaborative projects. 4 A common challenge inherent in many of these projects has been how more practical exercises could be integrated into the curriculum (van der Vliet and Deacon 2004). Another challenge has been working with large classes for whom it is impractical to provide access to professional equipment. The CFMS rather invested in professional equipment for students in senior courses as part of the Production stream. This represents a balance between what types of technology interventions we considered feasible and what is seen as necessary to support student learning (e.g. Tomaselli and Shepperson 2003; van der Vliet and Deacon 2004). These collaborations have contributed to the ongoing staff development project ICT-UCT and are clear indicators of how interdisciplinary links between content specialists and ICT and learning specialist may be initiated, negotiated and sustained. They also provide important locally situated examples of how ICT can be co-developed and implemented locally. Here the media rich character of these activities provides multimodal resources for other CET partnerships with academic departments. ICT has been rapidly taken up as part of teaching and learning in higher education, especially since the development of the web has made collaboration and distribution part of the global culture. Laurillard's (2002) review of how ICT can support teaching and learning in higher education suggest we think in terms of different media forms that emphasise different modes of conversations between lecturer and student. Productive media are one of these that have a very intuitive value in supporting learning, but can present many challenges in devising such activities (e.g., Papert 1991). For universities in many 'developing' countries, web access remains problematic and there are perceptions that the roles and engagement of students is often compromised. This demands that educators devise activities suited to local conditions, allowing students maximal involvement given restrictions of bandwidth, quality of the infrastructure, time on screen and collaborative connections. Lecturers and tutors who are motivated to use ICT as an active and experimental part of their own pedagogy add innovative tools and methods to their formal conducting of content. There are numerous cases illustrating these points, one of which is HyperLand, a CD-ROM project that involved deconstructing representations of land in Zimbabwe (Morrison 2001). Here students were involved in the selection and development of content, peer tutoring and student-led introductions to hypermedia for staff. 7 As Buckingham and Sefton-Green (1991: 303-304) argue, 'by giving the students time and space to experiment, and to bring their cultural experiences to the technology, we hope to explore how their "writing" challenges our concepts of literacy'. This captures the insights we wish to gain in developing multimodal production activities that are otherwise often invisible. From a staff development perspective, there is a growing need to support lecturers in their understandings of how activities such as Director's Cut are conceived (e.g. Littlejohn 2000; Laurillard 2002) as it is generally not obvious how to design such learning activities without lecturers' active contributions. CET approaches this by promoting the building of a Community of Practice (Lave and Wenger 1991; Wenger 1998, Wenger et al 2002) between the various production and pedagogical participants in applying new media technologies to university level teaching and learning. Here we refer to a Community of Practice as group of educators who meet to discuss and develop shared practices, informed by their own experience as practitioners and researchers. Additionally the contribution of process that involves developing artefacts such as Director's Cut is acknowledged as these serve as 'a point of focus around which the negotiation of meaning becomes organised' (Wenger 1998: 58). Analogous to how audiences understand cinematic conventions without necessarily recognising the production techniques being employed, lecturers may understand how exercises such as Director's Cut support learning without always understanding how they were developed. Such an activity is obviously not about teaching software engineering or programming but rather an abstract language to discuss the integration of the development and implementation of pedagogy, content and software designs (Peterson 1998; Torrisi-Steele and Davis 2000; Sinclair et al 2002). As Salomon (2000) has so clearly argued, it is the educational rationale and not the technical tool that is of primary concern behind these integrative moves. Without such understandings, we would argue that there may be fewer creative uses of technology and less sharing of ideals within the community of educators. Often the initial reactions of many lecturers are that their courses have no equivalent types of activities and that these seem too complex (Porter and Corderoy 1998). In building a Community of Practice, where academics are encouraged to think of ways to use technology beyond a traditional course management system structure, the language of designs and architectures becomes an important tool to probe alternatives (Mason et al 1999). This language is built through collaboration and the circulation of different disciplinary and interdisciplinary intersections. Cases such as Director's Cut provide locally developed examples of how collaboration may be realised. Attention to genre is central to both film making and the more analytical field of film studies. 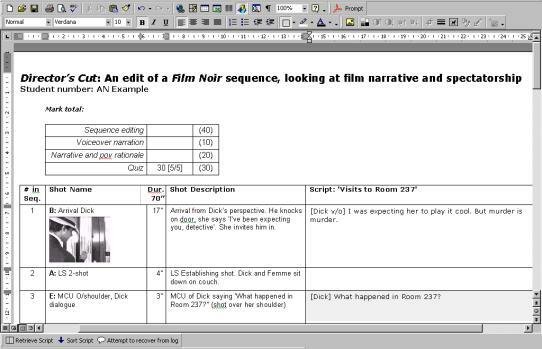 For Director's Cut , Jane Stadler developed a shot list for a scene in a Film Noir style interrogation scene in which the Detective questions the Femme Fatale about her whereabouts and actions on the night a crime was committed. Rather than locating the story in the original Film Noir of the 1950s, we were also inspired by more recent Noir films such as LA Confidential that incorporate modern stylistic elements. Past students of the course were employed to act in, film and edit the footage. This encouraged students to identify, both personally and narratively, with the material and their own edit. The clips for each scene were shot from different points-of-view (i.e., both the Detective's and the Femme Fatale's ), multiple camera angles (e.g., long shot, medium close up, big close-up) and various cut-away imagery (e.g., gun, glass breaking and champagne cork popping for a loud noise). These shot choices are the building blocks for 'director's' to tell their own story, deciding whether the detective is suspicious about the Femme Fatale having an affair or that he suspects that she killed a man, among other choices. Students can choose whether to tell the story from her point of view, or from his or alternate between the two. They write the voiceover narration, as is conventional in the Film Noir genre but must use the given dialogue where one can see the actors speak their lines. This is the grammar which students must use to tell their story. The students had had lectures and readings on film narrative, screenwriting, genre and spectatorship that prepared them for understanding these concepts that they now needed to apply. Figure 1: Storyboard showing Director's Cut interface to create a sequence. A jump cut was added which will cause Director's Cut to remind the student to insert a reaction shot in between the two similar shots of the Femme. The Director's Cut learning design focuses students' attention on what we considered the core learning objectives by automating and simplifying the unassessed aspects of the task as far as possible. The underlying data structures define the power of the grammar which students can communicate their ideas. Since the clips are known in advance, unlike a professional editing suite, we can associate various descriptive attributes or semantics with each clip. The lines spoken by the actors, the length of the clip, the camera angle and other descriptive information that a director would know are all stored in a setup database. The program retrieves this information so it can be used when appropriate. This approach simplified design negotiations allowing some behaviours to change even once some students had started using the program by editing information in the setup database as we saw how students responded. Other information stored in the program captures what students do, such as the ordering of their clips and the text for their voiceover narration. Only the student's own information needs to be saved. When closing Director's Cut , the sequence and responses are stored in a central database, allowing students to return later where they left off (Deacon and Jaftha 2004). Describing the operations of such an interface and even giving instructions to students on how to develop their sequence can be more difficult and less effective than a demonstration or trying to create one's own sequence. 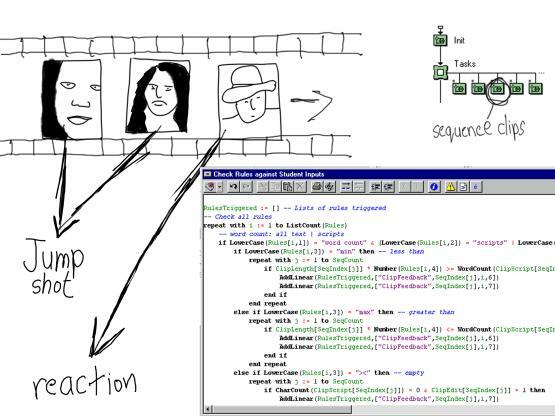 In this paper we illustrate how a student might work in creating their sequence by using a storyboard-style diagram. This is in keeping with our approach, inspired by concepts underlying multimodality and multimedia learning (Mayer 2001), to explore a range of integrated strategies to communicate information such as the instructions and feedback. Our ideas have evolved over a number of projects (e.g., van der Vliet and Deacon 2004; Deacon et al . 2004, Skjulstad and Morrison 2005 in press ) where multiple abstractions of information are offered to support learning. Film textbooks describe in detail the 'rules' or 'conventions' used in TV and film. In exposing students to these rules we wanted to allow them to create learning artefacts to demonstrate their understandings rather than simply recalling a list of the definitions. The combination of technology to support this approach is one of the more novel aspects of our design. An important aspect involved using rules to generate feedback as students construct their sequence or write their answers. The program has sufficient information to detect for example jump-cuts, scripts that are too long and dialogue that includes inappropriate words. Our feedback rules can be reduced to two generic forms. The simplest form considers a single clip's attributes, such as the voiceover text a student wrote, and applies a function to count the words and sentence length, or find specific words. Feedback is generated if there are too many words, sentences are excessively long or inappropriate words are used. The second form considers a pair of clips in the sequence. This allows the detection of repeating dialogue, a jump cut effect or crossing-the-line-of-action. A schematic representation of the mechanisms to detect this is illustrated in Figure 2. Working with a small number of clips it is feasible to specify all rules for detecting clip combinations we want to give feedback on. We used 72 feedback rules of the first form that operate on to a single clip and 38 of the second that check for pairs of clips in a sequence. The rules are checked whenever changes are made to the script, sequence or answers and the feedback formatted as a paragraph which appears on the screen. This might include a suggestion to insert a reaction shot to avoid the jump cut effect. 8 Essentially this exploits the 'Eliza effect' that depends on students believing that the feedback is actually intelligent even though the mechanism is a simple automated response (Hofstader 1995). Here tutors play an important role in discussing, for example, how a student responds to feedback and when it might be ignored. Many students commented on the influence that feedback had in identifying issues they would not otherwise have considered, but did not completely eliminate the types of mistakes the rules react to. The number of students who ignored the most basic cinematographic conventions was reduced significantly, allowing the assessment to reward aspects more central to the learning outcomes. A session was held to familiarise the tutors with Director's Cut prior to the first session with students. Interestingly the tutors found the task challenging, as they soon realized it was not straightforward to construct their own sequence or answer the questions. UCT, like most other 'developing' countries, continues to rely heavily on computer laboratories as students do not have sufficient access. This is in contrast to trends elsewhere where universities are dismantling many teaching laboratories in favour of distributed campuses. Here students are working independently, often on their own computers and over the web. Exploiting the teaching opportunities in our laboratories has been important to us, allowing greater interaction with tutors and more video-rich activities than would otherwise have been possible with web supported independent forms of learning. The course has 1 tutor per 20 students in a class of 250 students. The laboratory has 80 computers so we held five 45-minute sessions to accommodate the class. The introductory session is an effective model to clarify the activity and assist students with conceptual issues that are otherwise difficult to communicate effectively. These ran during a single weekly teaching cycle, with students completing the task in their own time and handing-in two weeks later. Figure 2: Shows jump-cut from Figure 1 and how rules in Authorware code are checked. In addition to creating a sequence, students are required to answer five open questions and five multiple-choice questions. The open questions ask students to propose a title for their film, outline the back-story, identify the dominant point of view in their sequence and provide an explanation of their own 'directorial signature style' using terms drawn from film theory. This involves discussing the impact they intended their sequence to have on a film spectator, particularly in terms of character engagement. Requiring students to answer such questions demands reflection and appreciation of how they worked (possibly intuitively) to develop their sequence. A number of students commented on how this allowed them to recognise inconsistencies and contradictions in their own work more clearly. The five multiple-choice questions had a different role in underscoring the relevance of film theory to creative praxis. Each question required students to play a clip randomly assigned to them and identify how a particular film theorist would have characterised the clip. The different question variants were designed to avoid plagiarism. The articles discussing the film theorists' ideas are included in the course reader. Essentially this quiz is confirming whether or not students have done their readings and can understand and apply the theoretical terminology used in the academic articles. The multiple-choice quiz is automatically assessed when students prepare their storyboard for printing. While it may appear sufficient to submit ICT based assignments electronically, there are several significant advantages in requiring student to hand in a paper copy of their work. In part this is because many students want copies for their portfolios and tutors find a paper copy easier to read and write comments on, but it is also important as a record of completion and for the external examiner to review. Thus the mode of assessment differs slightly from the mode of production and we wanted students to be aware of this change. Once students have finished developing their edit in the Director's Cut program, they had to open the Storyboard Loader to print their sequence and answers. The Storyboard Loader is a Microsoft Word document that when opened queries the database and extracts the student's saved work, formatting this in a storyboard layout (see Figure 4). This functionality builds on work developed in other projects involving the customization of Microsoft Office applications to support learning activities 9 (Deacon et al 2004). Having a familiar word processor document allows students to do any final text editing such as correcting spelling before handing-in. Changes are saved back to the database so students can return to change their sequence in Director's Cut. Figure 4: Screengrab of the Storyboard Loader showing a formatted sequence that tutors mark and add comments to. Independently, tutors can call-up and view the video sequence. Our intention had not been to setup an experiment to measure the impact of Director's Cut on student learning as in any real course there are far too many variables that cannot be controlled. Such approaches have tended to offer limited insights into many aspects of the learning design we wished to share within the community of educators (e.g., Sandoval and Bell 2004). Rather here we have been interested in for example what students did and impressions of tutors in the course in reflecting on the context. In these larger courses tutors have important roles in both facilitating learning and assessment of tasks. The negotiated learning design was influenced by the requirement for the assessment to be aligned and straightforward for tutors. Interestingly, in the beginning some tutors found their assignment role difficult as they were then not as familiar with the clips as students had become in creating their own sequences. Tutors had to watch students' sequences because they could not yet visualise a sequence on paper, recognise the reasons for some more subtle choices or how the voice-over would sound in relation to the images. We had created a version of the Director's Cut program that allowed tutors to easily retrieve different students' sequences and play them while they marked at the paper copies. Tutors remarked that students came up with an unexpectedly wide range of ways of combining a limited set of clips, elaborating and personalising their meaning by writing voice-over scripts, and explaining their meaning using critical reflection. The statistical correlation between the marks awarded by tutors for Director's Cut and the final mark while significant was not as strong as those of the two essays suggesting different types of understandings were being assessed. This supports the observations made by several tutors that different groups of students had done well in the Director's Cut exercise, rewarding students who could articulate the connections they made between theory and practice. There were 24 students in the Production stream who already had experience using professional video editing applications. A number of these students remarked that as they knew how to edit their sequence using Adobe Premiere and that they had sometime felt limited. We observed that these same students were generally no better in articulating their intentions within the Director's Cut constrains of producing a rough edit and using the theory to explain intentions. There were clips or combinations of clips we thought students should never use, as they were essentially 'mistake shots' or edits not acceptable in Film Noir . Not all of these triggered automated feedback, as we had been curious about what students would produce. While these clips were the least frequently used, still about 30% of all students used at least one of these potential 'mistake' shots with smaller numbers ignoring automated feedback. A few ingenious strategies emerged such as including shots that crossed the line-of-action by inserting flashbacks in between these clips. The repetition of dialogue, used by nine (9) students, was justified by some to create effects such as a 'postmodern style'. While encouraging these imaginative edits we insisted that students justify their choices in order to convince their tutors of the merits. The tutors enjoyed discussing among themselves, which they considered original ideas and which could not work or were simply confusing. We also emphasised that since sequencing clips of a fixed length is really only a rough edit, students could add notes suggesting how the in and out points of individual clips could be changed. This 'gap' between abstract understandings of concepts or words and the concrete relationship to audio-visual material is one of the difficulties students have in film studies that was raised in the examiners' meeting. Here Director's Cut was seen as having contributed to addressing some of these concerns, among both weak and strong students, which had not been addressed in another course where there was no equivalent exercise linking practice and theory. Director's Cut demonstrates an approach to learning through multimodal production, by developing microworlds rather than using professional applications or by limiting the modes of expression. The interface supports the basic tasks students need to construct a filmic sequence, testing their understandings of film narrative and spectatorship. This functioned as a capstone activity in the course, promoting skills expected in later courses. Elsewhere (Morrison et al 2005 under review) we have included students' comments on the strengths and weaknesses of the activity as a resource for its redesign. Here we have focused on how the Director's Cut design developed from earlier activities and the community of practice among academics in the CFMS. In CET's staff development programme Director's Cut is now used to illustrate how such communities develop and what can emerge to address specific requirements of a course. This has been very valuable in generating broader discussion in how ICT can be used to support learning. Notions of multimodality, as advanced by Kress, need to be carefully negotiated when applied to large classes. While detailed issues of multiliteracies and multimodality may well be suited to small classes and more personal tuition, Director's Cut shows how close collaboration between learning designer and content specialist can result in educationally well founded outcomes in large groups. Without such cases it is not always clear how ICT can enhance students' understanding of, say, theory though production based learning. We argue that research on multimodal production has relevance for designing for learning because ICT offers new and different ways of integrating a number of elements in one main activity that has clear boundaries and expectations. A degree of certainty and predictability is important when working with large numbers of tutors and students within an inflexible timetable. In designing the Director's Cut exercise to bridge the divide between theory and practice, it was revealing to observe that while the vast majority felt we succeeded, several of the 24 Production stream students who had experience editing video felt constrained. They wished to add transitions, shorten clips, add music and even re-shoot footage that step outside the boundaries we established. While we had considered some of these features in Morrison et al (2005 under review), for the most part they are impractical using the basic technologies we used and would divert attention away from some of the underlying filmic techniques being taught making assessment complex. Rather we framed the exercise as being about creating a rough-edit and the links to theory rather than a complete production. We developed the Director's Cut application rather than purchasing professional applications or using cheap alternatives as these would have been impractical in our context. While students would welcome using professional applications, licenses are very expensive and training becomes involved and time-consuming. Rather we have invested in developing what we needed, following similar strategies to those that encourage 'developing' counties to adopt open source and that emphasise developing design skills rather than paying for licenses of often expensive technologies (Candy 1997). The requirement of a film theory course imposed additional constraints on the content and duration of the practical exercise. The focus of the creative interaction centred on the selection and sequencing of pre-shot footage with the addition of voice over narration which is comparatively straightforward to implement using existing development tools and the universities laboratory infrastructure. The quiz and reflective questions were tightly integrated within the same environment in order to challenge the students' to apply terminology from film theory, analysis to the screen text they produced and provided a written rationale. Where film theory attempts to explain how audiences respond to movies in terms of character engagement and the way in which viewers are positioned in screen space via camera angle and point of view, Director's Cut allowed students to apply theory in a relevant manner, using it to experiment with manipulating the spectators of the films they created themselves. When marking exams, tutors commented that students were able to recall, explain and apply the theoretical terminology that had been reinforced in Director's Cut at an unusually high level. In summation, investing collaborative effort into multimodal design strategies effectively enhanced learning by facilitating creativity among the educators within contextual constraints, and by enabling the interpenetration of theory, analysis and production within an integrated activity. Buckingham, D. and Sefton-Green, J. (1997), "Multimedia education: media literacy in the age of digital culture". In: Kubey, R. (Ed. ), Media Literacy in the Information Age . Transaction Publishers: New Brunswick USA, pp. 285-305. Buckingham, D. (1998), "Introduction: fantasies of empowerment? Radical pedagogy and popular culture". In: Buckingham, D. (Ed. ), Teaching Popular Culture: Beyond radical pedagogy, UCL Press: London, pp. 1-17. Buckingham, D., Grahame, J. and Sefton-Green, J. (1995), Making Media: practical production in media education . The English and Media Centre: London. Candy, P. (1997), "Some issues impacting on university teaching and learning: implications for academic developers". In: Armstrong S., Thompson, G. and Brown, S. (Eds. ), Facing up to Radical Changes in Universities and Colleges. Kogan Page: London, pp. 170-180. Chatman, S. (1978), Story and Discourse: narrative strucutre in fiction and film . Cornell University Press: Ithaca. Cubitt, S. (1993), Videography: video media as art and culture. Macmillan: London. Czerniewicz, L. (2004), "Cape of Storms or Cape of Good Hope? Educational technology in a changing environment". British Journal of Educational Technology, vol. 35, no. 2, pp. 145-158. Davis, H. and Reed, Y. (2003), "Assessing multimodal texts in multilingual classrooms". Perspectives in Education, vol. 21, no. 1, pp. 101-114. Deacon, A. (2002), "NewsFrames: Engaging Students in Framing and Debating News". In: Proceedings of the Multimedia Education Group Colloquium, University of Cape Town, pp. 536-557. Deacon, A., Jaftha, J. and Horwitz, D. (2004), "Customising Microsoft Office to develop a tutorial learning environment". British Journal of Educational Technology, vol. 35, no. 2, pp. 223-234. Deacon, A. and Jaftha, J. (2004), "Database-driven approaches supporting tutorial-style learning activities". Proceedings of the CITTE Conference, Cape Town. Flowers, J. (2001), "Online Learning Needs in Technology Education". Journal of Technology Education, vol. 13 no. 1. Hofstadter, D.R. (1995), Fluid Concepts and Creative Analogies: Computer Models of the Fundamental Mechanisms of Thought . Basic Books: New York. Kolb, D.A, Richard E.B. and Mainemelis, C. (2001), "Experiential Learning Theory: Previous Research and New Directions". In: Sternberg, R. and Zhang, L. (Eds. ), Perspectives on Cognitive, Learning, and Thinking Styles. Lawrence Erlbaum: New York. Kress, G. and Van Leeuwen, T. (2001), Multimodal Discourse: the modes and media of contemporary communication . Arnold: London. Kress, G. (1998), "Visual and verbal modes of representation in electronically mediated communication: the potentials of new forms of text". In: Snyder, I. (Ed. ), Page to Screen: Taking literacy into the electronic era. Rotledge: London, pp. 53-79. Kress, G. (1999), "'English' at the crossroads: rethinking curricula of communication in the context of the turn to the visual". In: Hawisher, G. and Selfe, C. (Eds. ), Passions, Pedagogies and 21st Century Technologies . Utah State University Press: Logan, pp. 66-88. Kress, G. (2003), Literacy in the New Media Age. Routledge: London. Laurillard, D. (2002), Rethinking University Teaching: a framework for effective use of educational technology (2nd edition), Routledge: London. Lave, J. and Wenger, E. (1991), Situated Learning: legitimate peripheral participation . Cambridge University Press: Cambridge. Lemke, J. (1998), "Metamedia literacy: transforming meanings and media". In: Reinking, D., McKenna, M., Labbo, L. and Kieffer, R. (Eds. ), Handbook of Literacy and Technology: transformations in a post-typographic world. Lawrence Erlbaum: Mahwah, pp. 283-301. Liestøl, G. (1993), "The digital video album. On the merging of media types in multimedia". Teletronikk , vol. 4, pp. 31-37. Liestøl, G. (1994), "Aesthetic and rhetorical aspects of linking video in hypermedia". Proceedings of the European Conference on Hypermedia Technology (ECHT '94). ACM Press, pp. 217-223. Mason, J., Dellit, J., Trask, J. and White, G. (1999), "Toward a new educational culture - matching human networks with the technical architecture". ICCE 1999 Conference Proceedings. Mayer, R.E. (2001), Multimedia Learning. Cambridge University Press: New York. Miles, A. (2003), "Softvideography". In: Eskelinen, M. and Koskimaa, R. (Eds. ), Cybertext Yearbook 2002-2003. Research Center for Contemporary Culture: Jyväskylän, pp. 218-36. Morrison, A. (2001), Electracies: investigating transitions in digital discourses and multimedia pedagogies in higher education. Case studies in academic communication from Zimbabwe. Unpublished doctoral thesis (includes 2 CD-ROMs), Dept of Media and Communication: University of Oslo. Morrison, A. (2004), "Artful roles in blended learning: reflections on collaborative digital arts and Zimbabwe". E/merge04 conference, Cape Town. Morrison, A. (2005), "Inside the rings of Saturn". Computers and Composition, vol. 22, no. 1, pp. 87-100. Morrison, A., Deacon, A. and Stadler. J. (2005 under review), "Designs for learning about film genre". Nordic Design Conference Proceedings, Copenhagen. Nelmes, J. (2003), An Introduction to Film Studies (3rd Edition), Routledge: London. Papert, S. (1991), "Situating constructionism". In: Harel, I. and Papert, S. (Eds. ), Construnctionism . Ablex: Norwood, New Jersey, pp. 1-12. Peterson, M. (1998), "Creating hypermedia learning environments: guidelines for designers". Computer Asssted Language Learning, vol. 11, no. 2, pp. 115-124. Rabinowitz. P. (2002), Black and White and Noir: America's Pulp Modernism . Columbia University Press: New York. Sandoval, W.A., and Bell. P. (2004), "Design-based research methods for studying learning in context: Introduction". Educational Psychologist, vol. 39, no. 4, pp. 199-201. Skjulstad, S. and Morrison, A. (2005 in press), "Movement in the interface". Computers and Composition. Tomaselli, K.G., Shepperson, A. (2003), "Gearing up the humanities for the digital era". Perspectives in Education, vol. 21, no. 2, pp. 31-45.
van der Vliet, E. and Deacon, A. (2004), "Media rich, resource poor: practical work in an impractical environment". British Journal of Educational Technology , vol. 35, no. 2, pp. 213-222. Wenger, E. (1998), Communities of Practice: learning, meaning, and identity . Cambridge University Press: Cambridge, UK. Wenger, E., McDermott, R. and Snyder, W. (2002), Cultivating communities of practice: a guide to managing knowledge . Harvard Business School Press: Cambridge, MA. This paper is a result of a two projects funded by the Research Council of Norway: first, the ICT-UCT project between the Centre for Educational Technology (University of Cape Town) and InterMedia (University of Oslo) funded by the South Africa-Norway programme; second, the MULTIMO project at InterMedia, funded by the KIM programme. We are very grateful to the Andrew Mellon Foundation and the Centre for Film and Media Studies for funding the development of Director's Cut . Special thanks to Stacey Stent for creating the illustrations used here and for the graphic design of Director's Cut . For their comments on the paper, we would like to thank our colleagues at CET and CFMS at UCT, and InterMedia (University of Oslo). 1 Considerable attention has been given to teaching about story-discourse relations (Chatman 1978) and to the ways in which ICT has made it possible to circumvent the text's time of telling through for example the VCR (Cubitt 1993). Attention to video as part of hypermediated communication (Liestøl 1999), has tended to focus on ways of linking and connecting digital video through non-sequential information structures and link-node relations (Liestøl 1994, Miles 2000, Miles 2003) and has been less about students' own making of digital video and learning about and through producing filmic discourses via ICT. There is a small body of work about teaching about video within hypermedia (Liestøl 1993), visual aspects of web design (Wysocki 1999) and online video blogging (e.g. Miles 2005). 3 Several members of the Centre have an interest in how digital media technologies may be implemented in film and media courses, productively and analytically. This has resulted in several close collaborations with CET. In particular, these have been strengthened by the move of a former CET member to the CFMS. NewsFrames (1st year, 450 students): Here students are given the chance to apply their understanding of how news is framed on the front page of a newspaper by writing the headline, caption and selecting a photograph (Deacon 2002). The aim is to engage students in the news production processes and the controversial debates that emerge when they need to write a headline to attract the readers' attention without causing offence (30 words to frame the front page). NewsScripts (2nd year, 300 students): This web-based exercise requires students to write an accompanying script for a prepared TV news segment on the Asian tsunami, using footage shot by tourists. This involves students sourcing facts, writing to picture, and applying news production conventions so that their script can be read to the video clip we provide (120 word script). The exercise is not dissimilar to how many TV news items, bought by a local broadcaster, are prepared for our local audiences. NewsBreaks (3rd year, 200 students): Here students can sequence and select clips to edit together their own television news segment, using footage of a controversy surrounding a local penguin colony (van der Vliet and Deacon 2004). They then write the accompanying script and provide justifications for their choices (300 word script). Like Director's Cut, NewsFrames and NewsBreaks were developed in the application Authorware. EduSoap (3rd year, 200 students): Student working in groups must prepare a tender for a TV educational soap opera production. This involves preparing a digital storyboard for an episode and presenting a pitch to the class and invited television personalities (van der Vliet and Deacon 2004). Here technology was seen as a facilitator in encouraging creative expression in larger classes while providing students with some practical skills in fictional narrative. 5 The implementation of ICT across of variety of higher educational institutions and contexts has had a challenging and transformative effect on teaching, learning and research. Candy (1997: 179) argues that such institutions in the 'developing world' need to anticipate these effects and changes and to devise local strategies for engaging with them. In post-apartheid South Africa, ICT is seen as an important but necessarily integrated part of wider educational change process. The issues around for example globalisation, changing expectations of higher education and the 'digital north-south divide' are perceived to be inhibiters to flourishing places of learning. 6 This was provided by a grant to the Multimedia Education Group from the Andrew Mellon Foundation, USA. 7 University of Zimbabwe and the Harare Polytechnic students were included in HyperLand as a development resource and as catalysts for student centred making and critiquing of hypermediated communication and pedagogy. In HyperLand , however, the lack of undergraduate students in film and media restricted the possibilities of learning through making video. The system included 80 or so videos but these were integral to the overall pedagogical design rather than specific student-directed activities. Nevertheless, video was included in a student project on Zimbabwean pottery, first as orientation to their practice and related research, and second as a mode of voicing reflections on learning. These videos thus provide examples of the socio-cultural and experimental co-construction of learning though production. 8 Loosely related work on rules systems in 3D animation environments applies artificial intelligence approaches to for example select camera angles and shot scales dynamically (see Friedman 2003 for a recent review of this work). This context is more challenging since generally less information can be extracted from the scripts of a 3D animation game than from our prepared clips. The goal here is to develop various heuristics rules that capture cinematic knowledge of genre such as television sports coverage or soap operas to make 3D animation scenes appear familiar without detailed scripting of camera angles. These are designed for games or film pre-production planning rather than to support student learning. 9 Microsoft now supplies the Office suite to South African government schools at no cost and at significant discounts to universities, in perpetuity. Similar programmes are being initiated in other developing countries (http://www.microsoft.com/southafrica/education/). Given the fortuitous discounts, powerful functionality, pervasiveness and existing skills-base we considered it important investigate how Office can be exploited to support teaching and learning in our context (Deacon et al 2004; Deacon and Jaftha 2004). Our related work has included developing learning activities around Excel for tutorials o n research methods and economics, customising the application environment to support a tutorial-style learning valued in these courses.